I am one of those people who rarely ever gets the stomach virus. It’s been years since I’ve had to deal with it, and when I say years, I mean, at least ten because I think I was in middle school the last time I threw up. This past week I felt bloody awful. In a few of my previous posts, I’ve mentioned that I’m participating in Camp Nanowrimo, which means for the month of July, I am trying to write 15,000 words, which would double what I have thus far of my manuscript. I was incredibly excited about the challenge of this, and within a few days, I made it a nightly ritual to write each night before bed, usually at least 500 words. I wanted to break away from being a feast or famine writer and write every day instead even if I didn’t really feel like it. It was going really well… until the 10th. I made it through my day at work, and I didn’t feel that great. I felt dizzy, but sometimes my sinuses get clogged and I didn’t think much of it. Friday night, I felt horrible. Nauseous, dizzy, horrible headache, absolutely miserable. I sat staring at my computer with my outline beside me unable to do anything. 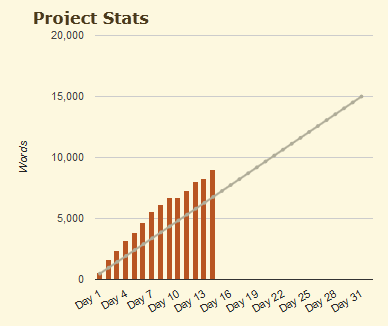 Flipping tabs to my Camp Nanowrimo graph, I sighed. There goes the writing streak. I ended up shutting off my computer and going to bed at eleven. The entire weekend I felt off. Just inexplicably sick without having any outward symptoms. I thought I was crazy. As I sat there pecking out as many words as I could before I burned out, I tried to figure out if the nausea was in my head or if I really felt sick. This continued for several days and probably reached its worst on Monday. Tuesday, the symptoms finally seemed to ease. I no longer felt like my head was going to blow off and every movement didn’t make me seal my lips against the threat of vomit. In the past I have had sinus infections that led to dizziness and nausea, so I figured that’s what it was and it would go away in a week or two. The same day, my mom calls and tells me that Shoprite called everyone who bought the frozen, prepared chicken we ate on Thursday because it had been contaminated with Salmonella. Can I just say that food poisoning is miserable no matter how mild. I know some people become violently ill and can barely leave the bathroom, but this was like nothing I have felt in a long time. If you feel lousy, you probably do. I don’t know if other people sit there wondering if they really feel sick or if it’s all in their heads, but trust your instincts, you’re probably sick and it’s okay to take a step back and recuperate for a day or two instead of stressing over what you haven’t done. More than likely it isn’t getting done well when you’re sick as a dog anyway. The entire time I wasn’t feeling well, I was so afraid I would stop writing and ditch my Camp Nanowrimo challenge. I ended up skipping a day (the 10th), but the next day, despite feeling crappy, I kept writing and recovered. Thus far, I am way ahead of my challenge goal for the day, and by the end of the month, I’ll have written closer to 20,000 words than the 15,000 I set out to write at the beginning of the month. Now, to get back to writing! PS- Stay away from frozen prepared chicken. It doesn’t taste that good, and the food poisoning is not worth it. I hope you get back to your full health very soon! Thank you! I’m feeling MUCH better, especially compared to Monday. That’s good news! It’s not pleasant when you get food poisoning! You are awesome! The fact that you only skipped one day while sick is incredibly, and your self-discipline this month has been inspiring. Keep up the great work! Thanks 🙂 I have honestly surprised even myself, but I’m determined to get into a routine for when the university starts up again.